Do you choose your liquid soap based on scent or which design matches your bathroom décor? Well, you may be getting a lot more than you bargained for. A commonly used anti-bacterial chemical is triclosan, a suspected immunotoxin and a suspected skin or sense organ toxin. Triclosan creates a carcinogen called dioxin, as a by-product. A Swedish study found high levels of this bactericide in human breast milk. Not all bacteria make people sick. Some are beneficial. Anti-bacterial soaps and cleaners kill both beneficial and harmful bacteria. By doing this, they actually leave us more vulnerable to the harmful ones we encounter. Children especially need exposure to some germs, to develop their immune systems. Scientists are concerned that the widespread use of anti-bacterials contributes to the development of resistant bacteria, ie bacterial that will only be killed by different or stronger doses of chemicals. So when we need to kill harmful bacteria, like strep, staph and e-coli, it will be more difficult. 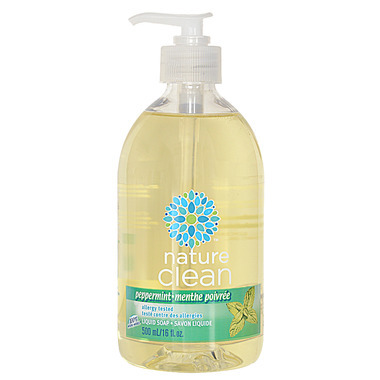 Nature Clean Liquid Soap is a 100% vegetable based, and created without perfumes, dyes, harsh preserving agents or animal tallow. Safe enough even for those consumers with environmental sensitivities. Ingredients: WATER, POTASSIUM OLEATE (NATURAL COCONUT CLEANSER), GLYCERIN (VEGETABLE SOURCE), SODIUM CHLORIDE (SALT) AND MENTHA PIPERITA ESSENTIAL OIL. My absolute favourite hand soap. I have to say I am quite impressed with this soap. Iâ€™ve tried a lot of natural soaps and this one dries out my hands the least. It actually feels likes youâ€™re washing your hands with moisture. And I really enjoy the mint smell! Itâ€™s also great to have an affordable gluten free soap in a house with someone with celiac! As a follow up to my previous review, I noticed that it leaves sort of a water resistant film in the sink that makes it look dirty even though you just cleaned it. Love this soap! Lathers well, smells fresh, rinses of clean and isn't drying. I also love that is has few ingredients and 0 harmful ones. This is a great soap! Nice and gentle and doesn't dry my hands out. I love the subtle smell of this soap. I mix it with water and use it in a foam dispenser. Works great! Great soap. I keep this beside my kitchen sink. Cleans, rinses well off of hands. The scent is to be desired-it smells like peppermint, mixed with what I can only really describe as French fry oil. Very weird smelling, not a fan at all. I use this soap in my kitchen and love the light minty scent. It foams nicely and leaves my hands clean. Also love that it is natural. A nice "natural" product, but I find it a bit drying. I bought a few natural hand soaps to try and this was my least favorite. I had it in the kitchen and I didn't feel it cleaned off grease well. Now I have it in the bathroom, but it leaves residue on the sink. On the up side the smell is nice and subtle and it doesn't dry my hands. This is my favourite hand soap. I always look for non-antibacterial, and I also have allergies to some perfumes so I love that this one has no artificial scent. It does what it's intended to do but the scent is very faint and I had to thin it out with water as it's quite thick and wasn't coming through the dispenser properly. Very good product. Cleans well, nice fragrance. You don't need a lot. LOVE this soap! I am so happy to have found this all natural chemical free soap. The mint is my favourite scent. It is very gentle and cleans very well. It is quite concentrated so just a little goes a long way. Overall I am extremely satisfied and will be buying this again. I like this product - the smell, the ingredients. Only a small amount would be enough. The only thing is that it requires a little bit more rinsing before your hands feel clean. Otherwise, your hands would still feel a bit slippery with the residue. This is a great product, smells amazing!! and leaves my hands feeling very clean, not dry at all. Not a five star only because it does leave a bit of residue but with a little more rinse its fine. Love this hand soap. Great mild minty smell, cleans well and it's made in Canada.I have been using this soap for about a year now. I love this hand soap. Finally a product without triclosan and yet thick enough to use in an automatic dispenser. Best soap - it doesn't foam up quite like other soap but I like it a lot better. So fresh and naturally-minty smelling, and never dries out your skin. My favourite! I've been using this great hand soap for a couple of years now. It far surpasses any other I have tried. It smells really good - just a hint of mint - and it is made in Canada, which is important to me. Nature Clean products are excellent for people with chemical sensitivities or asthma. Great value. We didn't like this soap at all. It smelled a bit waxy and did not rinse very clean. My mom came to visit and asked what was wrong with my soap as she stood there for quite a while trying to rinse the soap residue off her hands. Up side, good price for the size and all natural. Great soap, made in Canada, very lightly scented, great for kids - nice and thick! This is fantastic hand soap! It is just thick enough not to be wasteful (unlike Dr. Bronner's shakakai spearmint peppermint hand soap), and has a fresh pure peppermint scent that lingers briefly on the skin. Works well, smells great and comes in a large size.